This was originally posted on Mark Finkle’s blog. Mark is a member of the Fennec mobile team. The add-on (extension) mechanism built into the Mozilla platform is very powerful. One of the optional features is support for options (preferences) dialogs. As discussed in my last post, Fennec doesn’t like dialogs. In addition, Fennec has a simple, clean preference system. While designing the Fennec Add-ons Manager, we discussed how we would support add-on options. We didn’t want popup dialogs of random and complicated XUL. 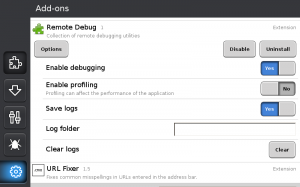 Add-ons use install.rdf to identify the XUL used for displaying the preferences. This is optional. <setting pref="extensions.myaddon.debugging" type="boolint" on="1" off="2"
As always, we appreciate your feedback. I’m in the process of updating the Fennec Best Practices documents with this information. A big thank you goes out to Vivien Nicolas, a Mozilla intern in the Paris office, for turning my super-great design into a reality. Shaver told me there’d be days like this!